I spent this past Sunday peach picking with the family for my dad’s birthday. Like father like daughter I guess: the past two years I spent my birthday (in September) apple picking. There is something so satisfying about picking your own fruits, or maybe it’s the fact that I wind up eating at least five while wondering around gorgeous fruit orchards. I definitely ate at least three peaches and half a pint of blueberries this time. It’s too tempting to pass up popping some in your mouth while filling a basket of fresh fruit! 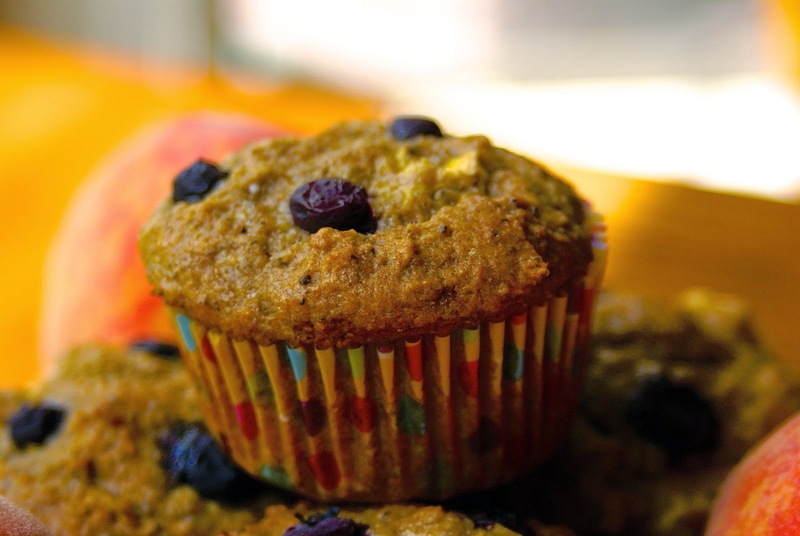 Everything was so ripe that I knew as soon as I got home I wanted to make a batch of muffins. 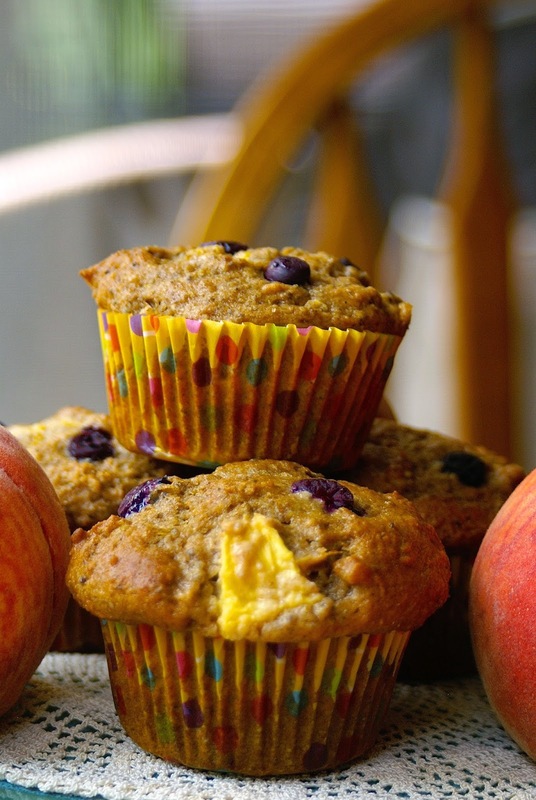 The past few times I’ve made muffins, they have been my zucchini carrot apple muffins because I have been picking so many zucchini from my garden; so it was time for some fresh fruit muffins! 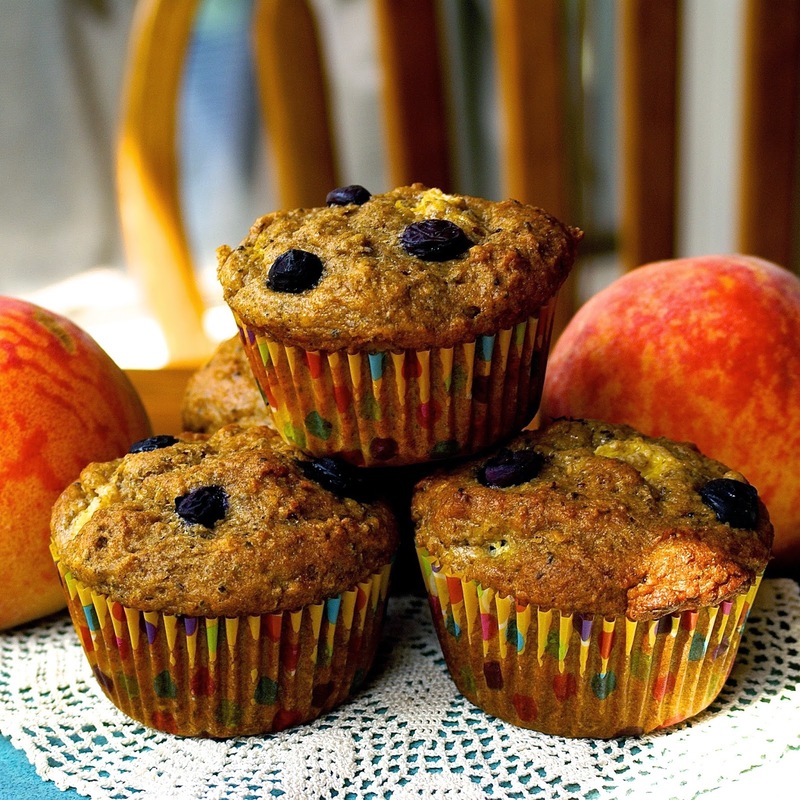 Peaches and blueberries are in season now, so you can go to your local orchard or farm stand and get both fresh to make these bad boys. 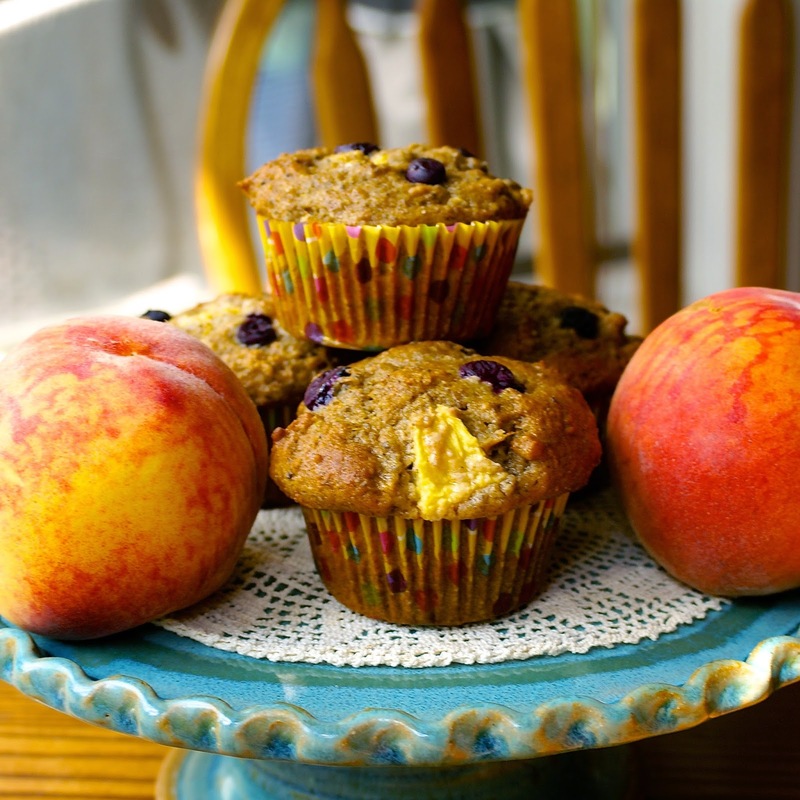 Everything tastes better when it is fresh, and the fruit for these muffins were picked about an hour before I made them. Winning! The combination of peaches and ginger is phenomenal, so I let those flavors stand out by accenting the sweet peaches and spicy ginger with tart yogurt and lemon zest. I added blueberries as an accent, for looks and because I had a giant bowl of fresh blueberries just begging to be be used. You can add more in the batter as well. 1. Preheat oven to 350 F and line a muffin pan with 12 tins. Whisk together the flour, baking powder, salt, and chia seeds. 2. Beat the coconut sugar, coconut oil, eggs, Greek yogurt, grated ginger, lemon zest, almond milk and vanilla extract in a separate bowl. 3. Slowly add the dry ingredients to the wet. Fold in the peaches. Divide the batter evenly between the 12 tins and top with blueberries. 4. Bake for 25-30 minutes, or until a toothpick inserted into the center is clean and the top is golden brown.